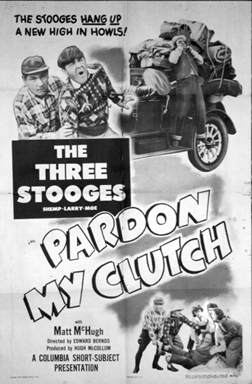 PARDON MY CLUTCH was Emil's fifth role with the Three Stooges, as well as his third Stooge movie in a row. The story has the Stooges attempting to take a vacation with an old car they just bought. Several times during the film, we're shown short scenes of Emil, dressed like a gentleman, peeking over bushes or from behind trees, but they don't seem connected to the story line. Finally, near the end, as the Stooges embark on their trip, the car breaks down, and Emil steps out of the bushes to talk to them. Introducing himself as a Hollywood talent scout in search of an old automobile for a movie, he offers to buy the car at a high price. The rascal who sold it to them, played by Matt McHugh, overhears all this and rushes in to give the Stooges back their money, claiming the deal was never finalized and that he's still the owner. As he collects a nice big check from Emil/Otto Klink, two "men in white coats" arrive to take Otto Klink, who turns out to be an escaped lunatic, into custody. Emil/Klink agrees to go with them after being told he can buy ten cars if he wants to, but only after lunch back at the asylum. With an orderly on each arm, Emil/Klink prances off wildly, whooping and hollering about buying cars like a, well, like a lunatic. 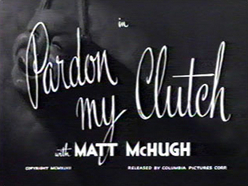 Emil's entire role in PARDON MY CLUTCH was part of a revised "Alternate Ending" found on three pages added to the end of the script. The original story had no "Otto Klink" at all, and when the old car gives out near the end, the Stooges simply throw rocks at Matt McHugh as he runs off down the street. The "Alternate Ending" is certainly more imaginative and easily much more funny. Shemp even does a little ad-libbing at the end when he imitates Emil's crazy yelling of, "Love it, love it!" At 10:30 A. M. I was promptly in Marvin Schmall's casting office at Columbia Studios waiting with Matt McHugh, whom I met for the first time. I was given another role in another Stooge two-reel comedy. This time I'm to portray a lunatic who furtively peeps at scenes all through the picture only to come in for the new "alternate ending" with a proposition to the Stooges. "Otto Klink" is a talent scout until two big men in white come to take him back! As "Otto Klink, Acme Pictures' Talent Scout," I earned $75.00 today in my fifth Stooge comedy at Columbia Ranch. This time I wasn't to get hit over the head with a bird cage, nor popped in the face with a custard pie - nay, nothing violent like that at all! I was a "lunatic," that's all. When they finally did get to me, it was just one, two, three - and all my peeping shots throughout the picture were done in a single take. No retakes! And the big scene came with expectations of trouble, I could tell. All the many technical and utility men gathered, the dialogue director came for rehearsal of lines, and things generally took on a transition of "well, now, here it is!" But, believe it or not, my "jumping" into my lunatic role was easier for me the than the "saner" ones. One take, and we did the complete scene with eccentric business, lines, and seven characters entering and leaving! The Stooges, namely Shemp and Moe Howard and Larry Fine, are great low-comedians - but jealous of their art. They will talk freely about personal things, but won't suggest a better way for me to do a part - & won't pose for still pictures with me. Interesting comments, but it's hard to imagine the Stooges were really jealous. From the context, it seems Emil may have meant "protective" instead of "jealous," but it is true there are no stills from this film showing both Emil and the Stooges, as there are from all four of Emil's previous Stooge shorts. 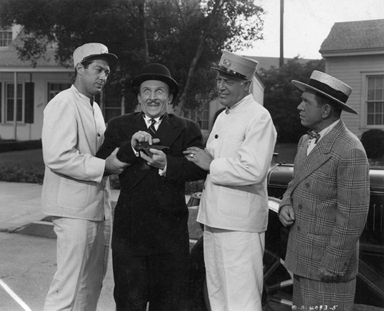 Regardless of what Emil may have thought he felt after the big scene, he was invited back many times and appeared in another thirty Stooge shorts over the next ten years.